“..The colonization of the plantation of the mind is now complete. It is not coincidental that those citizens who “consume” the most media are also the biggest buyers of junk food and its accompanying junk worldview based on consumption, faux novelty (“get the new chicken-bacon-cheese-double-burger today!”) and a passive disengagement from the real world: we endlessly watch cooking shows rather than actually cook real food in our own kitchens. The plantation of the mind optimizes consumption, impulse buying and short-term thinking: just buy the junk we’re pushing, and what happens to you afterward is your problem. One of the themes I’ve been addressing since 2008 is the neocolonial-plantation structure of the U.S. economy. The old models of colonial exploitation that optimized plantations worked by cheap imported labor (or situated in peripheral nations with plenty of cheap labor) have, beneath the surface, been adapted to advanced capitalist democracies. The adaptations have been so successful that not only do we not even recognize the Plantation structure–we love our servitude within it. As noted yesterday, the current mode of production optimizes the commoditization of everything: computer chips, fish and chips, labor, expertise, everything. This commoditization optimizes the Plantation Model of integrated production, global supply chains and distribution to global marketplaces, a hierarchical management focused on maximizing profits to send back to the owners, a ruthless focus on lowering costs via labor arbitrage (commoditize the work so it can be performed anywhere labor is cheaper/more desperate) and a fanatical desire to eliminate competition or fix prices via cartels to ensure high profits. Wal-Mart replaces the localized economy with a low-pay, highly efficient plantation economy in which the townpeople’s only choice is to work for Wal-Mart or scrape out a living feeding the Wal-Mart workers, doing their laundry, etc.–exactly as on a classic plantation. On a classic plantation, the wages are low and the “company store” offers easy credit, binding the workers to the corporation not just for wages but for credit. Those few who manage to save up enough capital to start small service businesses– laundry, cafes, etc.–must do so in the shadow of the Company, which can always drive them out of business should they speak against their corporate overlords. 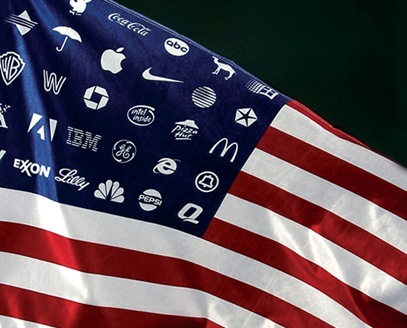 Isn’t it odd how this statement–the nation does not exist to benefit corporations, corporations exist to benefit the nation and its citizenry –sounds breathtakingly revolutionary in today’s politics of experience? One of the key concepts in the Survival+ critique is the politics of experience.This is an elusive concept because what we take for granted is invisible to us, and we have to go back in time, so to speak, to rediscover a history in which the experience of daily life was quite different from the present. Today, we accept it as “normal” that marketing worms into every once-private area of our lives. Not that long ago, adverts and marketing were limited to print media (newspapers and magazines) and TV–fundamentally passive media. Where the only public adverts were once billboards, now there are adverts on the shopping carts in the supermarket–another violation of what could be considered temporary private space–and on the floor of the supermarket. Even the rubber dividers used to separate one’s own purchases from the next customers now display an advert. The colonization of the plantation of the mind is now complete. It is not coincidental that those citizens who “consume” the most media are also the biggest buyers of junk food and its accompanying junk worldview based on consumption, faux novelty (“get the new chicken-bacon-cheese-double-burger today!”) and a passive disengagement from the real world: we endlessly watch cooking shows rather than actually cook real food in our own kitchens. Experience itself has become so derealized that we don’t even recognize our perceptions and experiences have been organized into neatly internalized plantations. It doesn’t have to be this way. As I explain in the Survival+ / Survival+ The Primer chapter entitled The Crisis of Neoliberal (Predatory) Global Capitalism, global capitalism has reached the limit of the plantation model in terms of exploiting new colonies around the globe and exploiting new sources of cheap, abundant energy. The only possible output of a hyper-financialized Plantation Economy is rapidly increasing wealth and income inequality–precisely what we see now. What we need is a social economy, an economy that recognizes purposes and values beyond maximizing private gains by any means necessary, which is the sole goal of hyper-financialized Plantation economies. Given the dominance of profit-maximizing corporations and the state, we naturally assume these are the economy. But there is a third sector, the community economy, which is comprised of everything that isn’t directly controlled by profit-maximizing companies or the state. It is not accidental that the current system of corporations, banks and the state increases inequality and erodes the community economy: the only possible output of low social capital is rising inequality. We have a choice. We can continue loving our servitude in our Plantation Economy, or we can choose another model and another mode of production.